What is S Translator and how do I use it on my Samsung Galaxy Ace 4? Samsung S Translator gives you an easy way to quickly translate spoken words or entered text into several languages. S Translator supports Brazilian Portuguese, English (UK), English (US), French, German, Italian, Japanese, Korean, Russian, Simplified Chinese and Spanish. Note: we suggest you connect to a Wi-Fi network with internet access when using S Translator. The translation process occurs online and is a data-intensive process. If you are not connected to a Wi-Fi network you will be asked to allow S Translator to connect via the mobile network. Touch Connect to continue with the translation process. It may be necessary to download and install S Translator. From the Home screen touch Apps > More options > Galaxy Essentials. Touch next to S Translator to begin the installation. From the Home screen touch Apps > S Translator . Select a language in the bottom and top boxes. 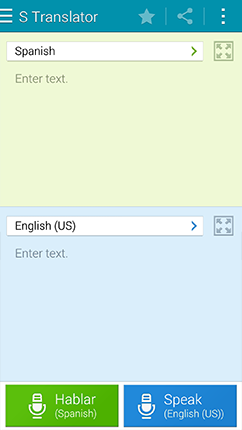 Touch either box to enter text to be translated using the keyboard. Or touch either speak button at the bottom to enter text using your voice. When entering text using the keyboard touch to translate. The text will be translated and displayed in both boxes. 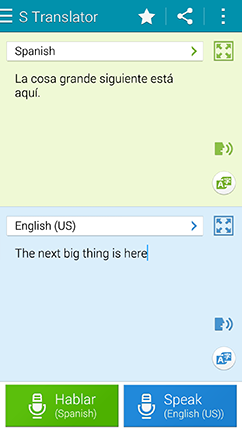 To hear the translation using text-to-speech touch the speech button in either box. 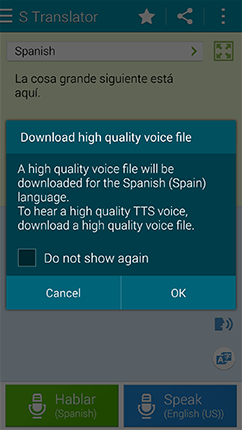 The first time you use the text-to-speech function for a language your device may ask you to download high-quality voice files. Touch OK to continue. You can mark the "Do not show again" check box to skip this request and download voice files for future requests. The voice files will be downloaded using Samsung Apps. You will need to be signed in to your Samsung account before you will be able to download additional voice files. Touch Free or Install to download the voice files to your device and follow the on-screen prompts to complete the installation. You can save a translation as a favourite by touching at the top of the screen. 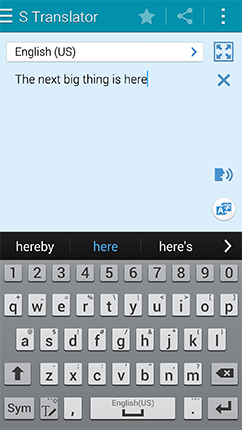 Touch at the top of the screen to share a translation and select the feature or app with which you wish to share the translation. TTS readout speed: Adjust the text-to-speech rate. Auto readout: Mark the checkbox to set S Translator to read out any translations when they are completed. History: View your translation history. Touch to add a translation to your favorites. Touch to view and play a translation. Touch and hold a translation to Share, Delete, or Copy. Favourites: View translations you have saved as favourites. Preset phrases: View the preset phrases for the selected languages. Select a category and keyword to narrow the results. What is Easy Mode and how do I activate it? What is Galaxy Essentials? Can I add/remove it from my Samsung Galaxy Ace 4 home screen? How do I use the music player on my Samsung Galaxy Ace 4?